Pathalgadi is Nothing But Constitutional Messianism So Why is the BJP Afraid Of It? Across the country, the engagement of citizens with the Constitution appears to be in direct proportion to the administration’s abandonment of it. That is why the government is trying to criminalise the belief that it will deliver anything more than it is doing already. 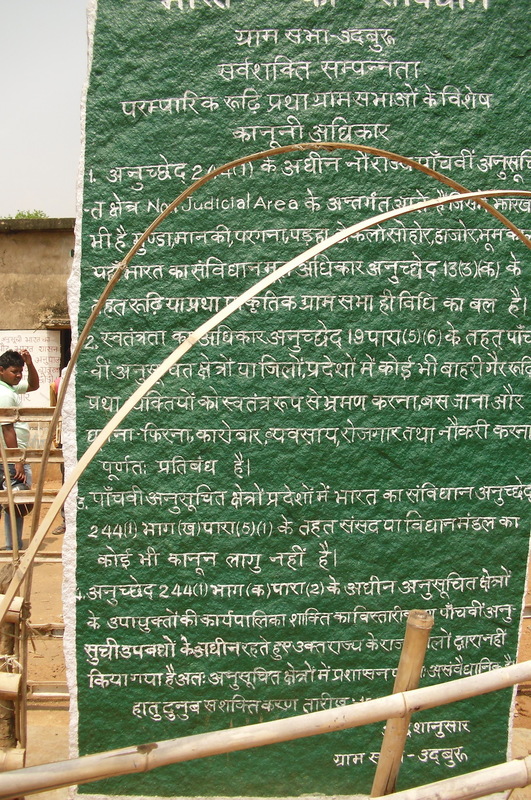 Ranchi (Jharkhand): On the freshly tarred road from Ranchi to Ulihatu, where Birsa Munda lived and which is now a prominent CRPF camp, several villages sport newly painted green stone slabs at the entrance, covered with constitutional provisions carved in white lettering. 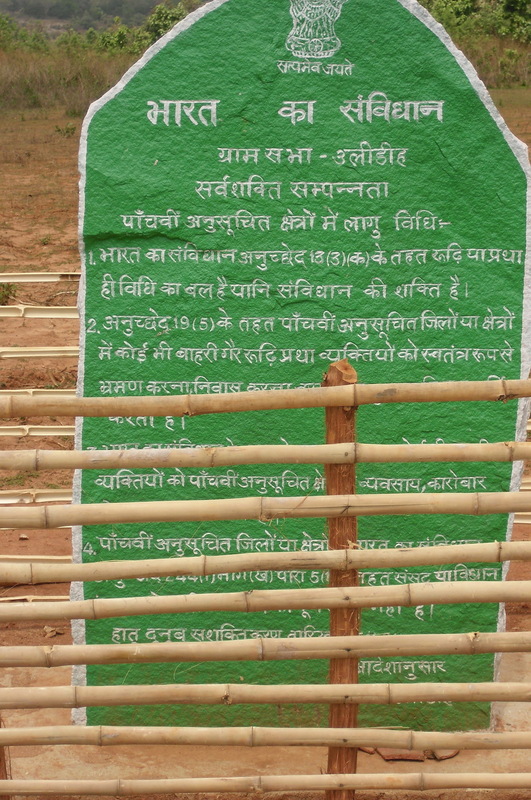 Protected by bamboo enclosures, these stones – symbols of the Pathalgadi movement – are anywhere between 8 and 15 feet high. In the past year and a half, this movement has spread rapidly across Jharkhand and the continguous areas of Chhattisgarh and Odisha. And the state governments concerned are not pleased. The preamble to the Indian constitution asserts that “We The People of India… Adopt, Enact and Give to Ourselves This Constitution.” If the people gave rise to the constitution, it stands to reason that they also gave themselves the right to interpret, analyse and propagate its contents in any form they want to so long as this is done peacefully. Nothing stops citizens from asserting their fundamental rights by way of speeches or written pamphlets, or in stone pillars outside our homes. There are thousands of statues across the country of Ambedkar holding the constitution which serve not just as a reminder of his role in drafting it, but as a symbolic assertion of the document itself – that it is meaningful in people’s lives and that it is they who give meaning to it. Yet the Pathalgadi movement’s deep engagement with the constitution has state governments panicked, perhaps because it raises questions that they are finding hard to answer. In Jharkhand, the administration has distributed leaflets and even copies of the constitution telling people not to be misled by the movement’s interpretation. In Chhattisgarh, BJP minister Brijmohan Agarwal has produced a propaganda video to warn people against Pathalgadi. The movement is being described as anti-national and seditious. Ruling party politicians describe it as a front variously inspired by Maoists, Christian evangelicals and opium cultivators. And of course, the government has resorted to its favourite strategy – jailing the leaders, many of whom come from the educated adivasi middle class and are government employees. In March 2018, the police arrested Vijay Kujur, a manager in the Shipping Corporation of India, and working president of the Adivasi Mahasabha in Jharkhand, while in May they arrested Herman Kindo (a former IAS officer) and Joseph Tigga (an ONGC ex-employee), the leaders of the movement in the Jashpur district of Chhattisgarh. Kujur and others have been charged under Section 153 A (creating hatred among people), 186 (obstructing public servants from duty), 120 B (criminal conspiracy) among others. However, repression has not been able to deter the movement, which is now being taken forward by second rung leaders, and indeed by ordinary villagers themselves. At least some of the energy in Jharkhand comes on the back of anger generated by the government’s attempts to change the Chhota Nagpur Tenancy Act (CNTA) and the Santhal Parganas Tenancy Act (SPTA) to make it easier for non-tribals and companies to take over adivasi land, as well as police firing on those protesting land acquisition. While the governor, Draupadi Murmu, returned the bills, the threat remains. On May 10, a friend and I set out to try and understand the Pathalgadi movement in Khunti district of Jharkhand. To our great luck, we chanced upon a meeting in one of the villages, being held under a beautiful old banyan tree. People had come from as far afield as Seraikela, Lohardaga, West Singhbhum, Ranchi, Gumla and of course, from other villages in Khunti district itself. Some of them had already established the ‘pathals’ in their village, while others were excited at the prospect of doing it soon. One group told us that they had placed their order for the slab – it would take a few weeks and would cost Rs. 8000. At the meeting, an announcement was made that pathalgadi would take place in 11 villages on the 27th. Crowds of 500 or more go from village to village erecting the stones. The atmosphere is both solemn and festive. Two young women told us that at the last event they had gone to, they were wearing ordinary salwar suits. But when they found all the other women wearing a traditional white sari with a red border, they also decided to come in formal saris for all Pathalgadi events. Most of those attending were men, but there was a small sprinkling of women too. Many were taking notes, and had copies of the constitution with them. Even though the meeting lasted some three hours, and involved interpreting difficult constitutional provisions, nobody was bored; indeed, judging by their faces, they were deeply absorbed by the proceedings. At the centre of the meeting was Joseph Purti, a former lecturer in Hindi in St Joseph’s College, Torpa. 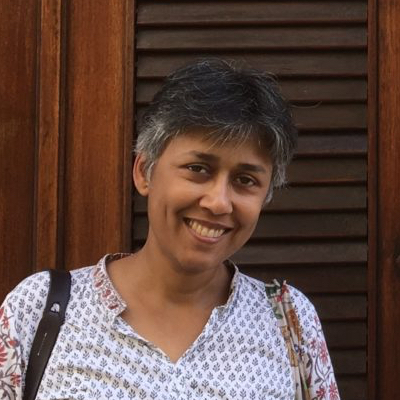 Wearing a white turban, kurta and jeans, Purti was writing on a white board, inviting comments and suggestions, much like an NGO or corporate breakout session. The Pathalgadi people in this area are followers of the Sati Pati cult, started by Kunwar Keshri Sinh of village Kataswan in Vyara taluka of Tapi district in Gujarat. Keshri Sinh’s son, Ravindra Sinh, now leads the Sati Pati movement. As an edited volume by K.S. Singh, Tribal Movements in India, informs us, there have been many such messianic and millenarian cults in adivasi areas, especially in South Gujarat. The Sati Pati movement believes that adivasis are owners of the land, a right that had been recognised by Queen Victoria. They refuse to pay land revenue, vote, or take part in government schemes. In Gujarat, they appear to be patronised by the ruling parties. Purti’s lead into the Sati Pati sect seems to have been a woman from Ulihatu who had gone to Gujarat; there are also several commonalities between Birsa Munda’s millenarianism and Keshri Sinh’s. The followers believe that their leader, Ravindra Sinh, has high-level links to the president of India, judges of the Supreme Court and even dignitaries abroad. Indeed, they attribute the four judges press conference to letters they had sent to the Supreme Court regarding changes in the CNTA. It is both sweet and sad that adivasis in a village remote from Delhi believe that the Supreme Court is responsive to them. Like its parent, the Sati Pati movement, the Pathalgadi movement too argues that the government is a servant of the people, and makes much of the acronym – OIGS – on India Government Service. One of the local leaders told us ruefully that government officials had been particularly incensed by being made to sit on the ground along with everyone else when they came to meet the Pathalgadi people. The local thanedar told him that he did not like being reminded constantly that he was a government servant. Another feature drawn from Heaven’s Light is the emphasis on the “non-judicial” or the natural as against the judicial or man-made conventions. While some of this appears outlandish, there is a strong kernel of truth to it, which resonates with people whose daily lives have been made difficult by an ignorant and indifferent bureaucracy. As Purti explained it, the judicial referred to laws made by the government and the courts, which had no relationship to reality. He gave two examples: laws fixing the age of consent at 18 and 21 which did not recognise puberty as a natural turning point; and the arrest of villagers on charges of being Naxalites. “There are so many Naxalite incidents, he said, but instead of catching the actual Naxalites, the police pick up innocent villagers, and frame false charges against them.” A recent study on under-trials in Jharkhand by the Bagaicha Research team found that 97% of those arrested for Naxalite offences had no connection with them. “The courts have so many pending cases”, Purti said, “but our gram sabhas do not have even one pending case. The judicial system only grinds people down, it does not deliver justice.” In the judicial system, “people come and ask us for our votes and then disappear.” Who can argue with this? The meeting had been called that day to finalise the setting up of an adivasi educational board and an adivasi bank. Purti’s job that day was to explain why the two were needed and what they would achieve. The meeting was also addressed by a professor, Man Singh Munda, who was preparing a Munda script. As for an adivasi bank, it was needed because the current banking system had no place for them. If they moved all their money and kept it in an adivasi bank, they would be able to run their own system better. The meeting ended up with everybody climbing a windswept hill positioned to look over a beautiful forested valley. This is to be the site of the school board and the bank. The Pathalgadi movement varies from place to place. In some places, they write the provisions of the Panchayats (Extension to Scheduled Areas) Act 1996 (PESA) on the slabs. PESA asserts that “every Gram Sabha shall be competent to safeguard and preserve the traditions and customs of the people, their cultural identity, community resources and the customary mode of dispute resolution.” Indeed, the inscription of PESA on stone slabs, as well as the assertion that the gram sabha is the basis of self-rule is a practice that dates back to an earlier wave of activism by former bureaucrat Dr. B.D. Sharma, who was instrumental in crafting PESA, and the Bharat Jan Andolan. In other places, however, as in the Mundari Khuntkatti areas of Jharkhand, the emphasis is on those features of the constitution which give force to the existence of a special law like the Mundari Khuntkatti tenure. The CNTA 1908 recognizes the Mundari Khuntkattidars’ special collective ownership of the land. The Khuntkattidars argue that they do not hold land under the state but in their own right, and the collective chanda they pay is tribute not tax. Articles 13 (3), 19 (5) (6) and Article 244 (1) – which are inscribed on the slab – collectively reinforce the legal exceptionalism that underpins both PESA and the CNTA. 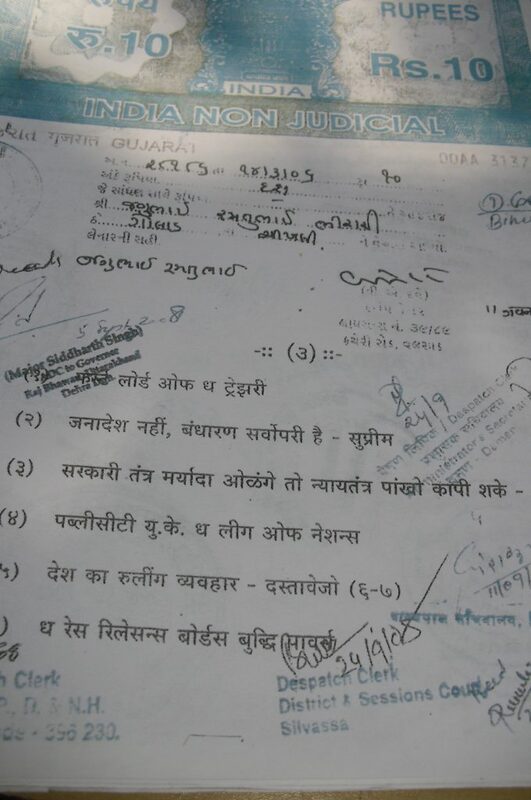 Article 13, or the inconsistency clause which voids laws inconsistent with fundamental rights, defines law in 13 (3) (a) as “any ordinance, order, bye-law, rule, regulation, notification, custom or usage having in the territory of India the force of law.” This is taken to mean that existing adivasi custom or law as defined by the village gram sabha (insofar as it does not violate the constitution) has the force of the constitution. Article 13 (3) (a) is also written on village walls with the message that village custom is their constitution. Article 244 (1) notes that the provisions of the Fifth Schedule shall apply to the administration and control of the Scheduled Areas and Scheduled Tribes (in central India). Under the Fifth Schedule, the governor may direct that a law should not apply to a Scheduled Area. Equally she/he can direct that a law shall apply to a Scheduled Area. In most states, all laws enacted are automatically assumed to apply across the state and there is no specific direction to apply them to scheduled areas. So the Pathalgadi people argue that arresting people under laws which have not been specifically enacted is illegal. In either case, the governor must consult the Tribes Advisory Council. The Tribes Advisory Councils rarely meet and governors never submit annual reports to the president as they are required to, under the Fifth Schedule. In this case, the government is in clear breach of the constitution, but is never penalised. In the course of the meeting, the organisers directly rebutted claims that the administration was making in its pamphlets and speeches, leading to much amusement among the participants. Distributing the constitution is of little help to the government since it is the interpretation and not the letter of the articles, which is being debated. It is written on the slab that according to Art 19 (5), outsiders are not allowed to live and work in adivasi villages without permission. The administration’s pamphlet calls this unconstitutional and violative of fundamental rights. A plain reading of Article 19 (5), however, suggests that the villagers may be right and the administration wrong, since the right to move freely, reside and settle in any part of India may be restricted by existing laws in the interests of the Scheduled Tribes. One of the complaints raised in the meeting was that the administration was trying to flatten out their distinctive identity, by threatening to take away reservations or by subjecting them to uniform identity markers. Aadhar and voter IDs were problematic because they reduced adivasis to “aam admi” while in reality, the adivasis are “khas admi” – distinct people, protected by distinct laws. While the people are clear about where they stand, the state has long been confused, as shown by its submission before the Jharkhand high court on the Panchayati Raj act. 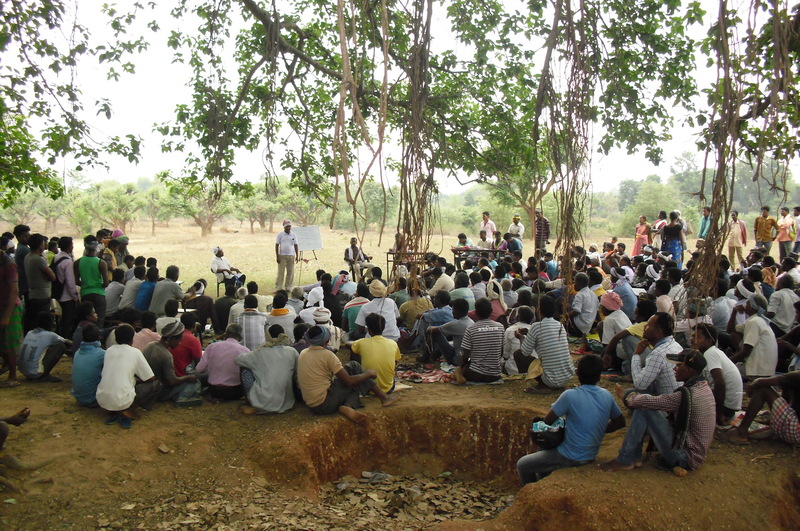 Even as it denied the need for specific laws for adivasis such as the Wilkinson Rules which allow some criminal powers to the village panchayats or any recognition of the Munda Manki system of traditional headmen, it cited the authority of PESA which is a constitutional law upholding adivasi custom. In truth, the current political regime would like to take away protective laws for adivasis, but the political costs are high. On other counts, both the Pathalgadi folks and the government seem equally confused. Even as they assert the constitution, Pathalgadi supporters believe that the provisions for excluded and partially excluded areas in the Government of India Act 1935 may still be considered to be in force (e.g. through the CNTA). When the government says that this has been superseded by the constitution, the Pathalgadi people point to the IPC, the CrPC, the Forest Act and other such acts which long predate and even counter the democratic revolution the constitution was meant to have ushered in. As we drove through the district, we also found some villages which did not have pathals and had no intention of having them. One woman told us that it had taken her a year to convince the people of her village to have a pathal. While all the bhuinhari households (original settlers) were convinced, there were others who were still holding out. Some of the villages involved in the movement have stopped taking government schemes, but others carry on with them. The government sees this withdrawal from the state as threatening – after all, they say, the CRPF, police and administration are only there to serve the people. They also claim that its schemes have been chosen and are managed by the gram sabha, and thus they have the same force that the Pathalgadi movement wants. 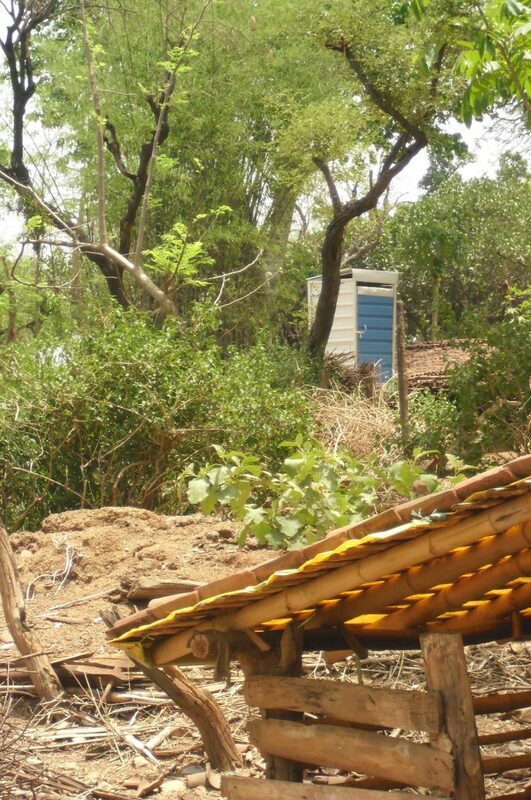 But one has only to look at the absurd pre-fabricated toilets that have been installed across the district, with no water connection and shallow pits, to see that these could scarcely have been a local priority. At some point in the evening it began to rain heavily, forcing my friend and I to return to Ranchi, leaving all difficult constitutional questions for another day. But what was clear to us is that once the people decide to read and interpret the constitution for themselves, it will be hard to stop them. Claims to judicial or administrative expertise in the reading of the constitution must always contend with the non-judicial reality, and it is far better to have a dialogue on the constitution than to arrest or repress people insisting that only the administration’s version of the constitution will count.